The radura Program offers components, which significantly support the overall performance of harvesters. They are often subject to high wear and must be replaced regularly. The radura Program provides high quality and fitting spare parts that ensure a simple application and safe use whether it is grain, soy, or grass crops. 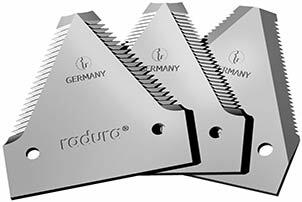 The radura sectional knife suits all cutting systems which work with forged guards. 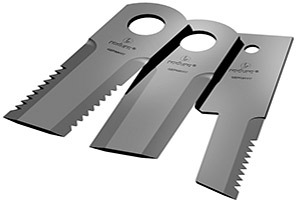 It’s a clearly structured knife system by using the same head and middle pieces. The adaption to the cutting width is achieved by variation of the different end pieces. It’s available for all popular headers. radura Straw is the new generation knives for choppers of combine harvesters and other chopping devices. All knives can be produced with smooth or serrated edges, with or without bushing, and additional top edge. Induction hardening, narrow weight tolerance, and reaming of the bore result in highest quality. 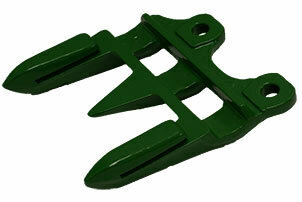 radura spring tines for hay equipment are of superior quality. They are made of patented spring wire, drawn in different stages to achieve the correct tensile strength and uniform elasticity throughout the complete structure of the tine.